New York Comicon 2014 is almost here! I hope you join me again for my educational panels. The big news…Copic Marker is joining us as a sponsor! They will be supplying our creators with gorgeous, high-quality markers for the panels. We will also have a representative from Copic Markers, who will be available to answer your questions. And prizes! We’ll also have some nifty prizes from Copic Markers. Of course, you’ll want to know who’s doing what and when, so here’s the schedule. Learn how to structure a complete issue from beginning to end. Pace, Panel breakdown and story arc discussed by Professional Writers who work for mainstream publishers like Marvel, DC and more. Support by Darren Sanchez. Hosted by Buddy Scalera of Comic Book School. Creators will use Copic Markers for this Panel. Talk to actual working Editors from Marvel, DC, Dark Horse and more as they discuss the business. Learn about submissions, professionalism and what it takes to make it as an Editor. Hosted by Buddy Scalera of Comic Book School. Meet Amanda Conner like you’ve never met her before…alone on stage. A brutally honest conversation about writing and drawing comics, breaking into the industry, staying employed and the inevitable ups and downs of a career. Just two friends talking about a career in the comic book industry. Hosted by Buddy Scalera of Comic Book School. See how real professional Artists break down a script and thumbnail a page. Actual working pros show you how they determine the layout, the story flow and specific Panels from a real comic book script. Creators will use Copic Markers for this Panel. Meet your next creative partner in this fun, interactive networking session. Bring business cards and samples of your work. This is the Panel that has literally helped complete strangers form creative teams and publish comic books. This is the original and best Creator Connection. Be there and launch your career. 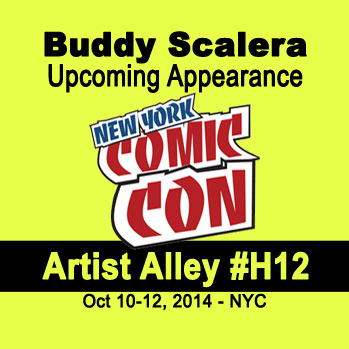 Hosted by Buddy Scalera of Comic Book School.